The LDH heritage dates back to the 1950s when the worldwide Gerber Group began importing canned goods into the UK. Since then we’ve grown to become one of the key suppliers to UK supermarkets. La Doria pioneered Italy’s large-scale processing of tomato-based products and canned vegetables. The family-owned business now operates 5 specialised factories in Italy including their historic site at Angri in Southern Italy where the Ferraioli family established the La Doria enterprise in 1954. Angri is located in the Agro Nocerino Sarnese area of the “red gold district”, Italy’s tomato heartland. This area has a long history in cultivating the renowned San Marzano tomatoes, leading to the sustained growth of the agro-industrial district which remains the main centre of production in Italy for tomato products. The leading supplier of own-label fruit juices in Italy, La Doria introduced own-label canned tomatoes and pulses to the UK and now exports globally. Strong grower partnerships, many of which stretch back for decades, ensure the high quality demanded by retailers. High-capacity and highly efficient production is backed by vertical integration and a commitment to investment and innovation to offer flexibility of recipe, packaging and service levels at highly attractive prices. A significant majority of LDH’s products is sourced from our own shareholders which gives them a vital role in our performance and growth, and gives us the influence to prioritise the products our customers want. Established in Gragnano, the historic pasta town of Italy, in 1912, Pastificio Di Martino has remained a family-owned and run business to this day. The original factory was completely rebuilt in 1985 after extensive earthquake damage. This site has 2 spaghetti lines and two pasta shapes lines. A new facility was established in Pastorano, just north of Naples with one of the largest shapes and spaghetti production lines in Italy and capable of handling 240 tonnes of semolina daily. The newest facility, dei Campi, is relatively small. Situated in the town of Gragnano itself, here Di Martino use traditional methods to dry the pasta and specialise in traditional and unusual shapes. As a result of the quality, heritage and provenance of the ingredients, including local aquifer water, we’re able to offer the prestigious IGP (Indicazione Geografica Protetta) status for our superior Italian pasta. Thai Union Group’s long history of frozen seafood processing and export started in 1988, growing to become the largest seafood company in the world by sales value. A highly efficient, vertically integrated seafood operator with truly global sourcing, production and distributing network, Thai Union Group’s expertise developed through decades of hands-on industry experience. 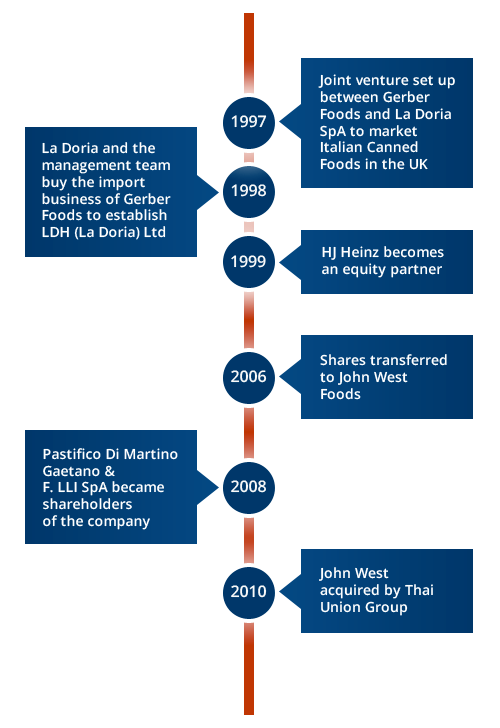 Thai Union Group now own leading brands in major markets including John West, Petit Navire & Parmentier in Europe.